Frill Media Pvt operates LushTrip.com. It provides daily/weekly hotel/resort/getaway deals to those who cant take out time from their busy schedule. LushTrip.com offers highly discounted getaway packages so customers can try new destinations and enjoy with their family. Get the best LushTrip.com deals at Wingcoupon.com. Book your flight tickets from Mumbai to Bangalore starting at just Rs. 3,987. Click on the Get Deal button to enjoy the benefits of this deal. Get flight booking from Mumbai to Delhi starting at just Rs. 6,082 at LushTrip.com. Grab this deal without using any promo code and save high. LushTrip.com offers flights from Delhi to Chennai starting at just Rs. 6,965 by using this great deal. No need to apply any voucher code to avail this deal. Enjoy Dubai holidays package starting at just Rs. 46,600 at LushTrip.com. Book now and create new memories. Book flights from Delhi to Hyderabad starting at just Rs. 5,860 at LushTrip.com. Utilize a reuired a coupon code to get your discount. 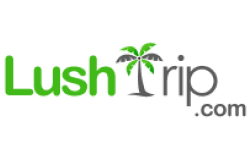 Get flat 3% off on domestic holiday packages exclusively at Lushtrip. Use coupon code to avail this amazing offer. Make your holidays special and reasonable with Lushtrip. Plan a four nights and five days trip to Thailand at just Rs. 13,300 with Lushtrip. No coupon code required to avail this deal. Grab this golden offer and get unforgettable fun and enjoyment. Book a six-day & 5-night package to Malaysia for Rs. 58,600 and get two extra nights free stay exclusively at Lushtrip. Click on Get Deal to avail this offer and save your money. Make your holidays wonderful with Lushtrip. Choose Lushtrip and get Mauritius holiday tour package at Rs. 22,500 only. Spend your holidays with Lushtrip and get such an exciting offer. Avail this deal and make your holidays memorable and reasonable. Book four nights Thailand holiday package and get two nights (1 night in Bangkok + 1 night in Pattaya) free only at Lushtrip. Avail this fantastic deal and save your massive money on your stays. Enjoy your holidays with Lushtrip and let’s create new memories.